History: Adolescent with hip pain. Avulsion fracture ASIS: a curvilinear ossific fragment is seen adjacent to the left iliac bone (yellow arrows), compatible with an avulsion fracture of the left anterior superior iliac spine. This is an avulsion fracture of the left anterior superior iliac spine, which is due to the sartorius muscle pulling off a fragment of bone at the apophysis, which is a growth center at the tendon attachment to bone. 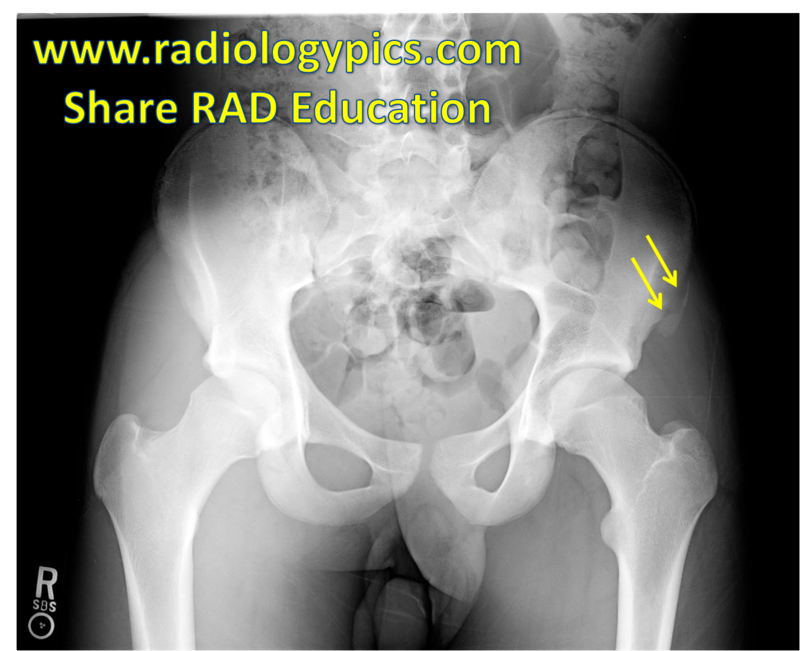 Other common areas of seeing avulsion fractures in pediatric patients include the anterior inferior iliac spine (rectus femoris), inferior pubic symphysis (adductor muscles), ischial tuberosity (hamstring muscles), and iliac crest (abdominal obliques and tensor fasciae latae). You can read more about avulsion fractures in the knee here.